Economic and political integration offers the only efficient pattern for the evolution of Europe over its history. There is no alternative to progressive processes of integration, although it may be imprudent to confuse the logic of economic consolidation with local projects aimed at expanding frontiers. In my opinion, in the current economic and political environment, the expansion of the Eastern Partnership is costly to all the parties involved, i.e. Ukraine, Russia and the European Union. The economic and political realities of today are discrediting the ideology of European unity, the product of the ideas of Bohemian King Jiři z Poděbrad (1420-1471) . To this end, special attention should be paid to the policies of the Baltic states, primarily Lithuania. Without any convincing successes in building either an efficient economy or civil society, these countries are attempting to act as transmitters of West European political and economic practices. The global economic crisis has distinctly uncovered Europe’s problems, indicating that the previous model of economic and political integration has worn out. The global competitive advantage for the entire European community is a strategic landmark both for me and seemingly for my opponents who regard Eastern Partnership as a success and Ukraine’s Euro-integration as its consequence. Today, the European space boasts two large-scale unification projects, offering a choice of integration landmarks and models, which were de facto nonexistent when the Eastern Partnership was first launched. In the early 1990s, Europe shifted to a new qualitative level of integration, i.e. from the EEC to the EU, whereas from 1995 to 2013, the number of members almost doubled, making true integration increasingly more difficult. The global economic crisis has distinctly uncovered Europe’s problems, indicating that the previous model of economic and political integration has worn out. With regard to these causes, we should note that we are not facing a crisis of the European idea, but rather its economic and political implementation. In chess, this is referred to as a “loss of quality with a gain in tempo”, the most risky strategy. The 2013-2014 economic predictions for the united Europe appear gloomy. According to the OECD, this year’s real GDP of the Eurozone should decrease by 0.6 percent and grow by 1.1 percent next year . On November 5, the European Commission published a forecast indicating that in 2013, GDP would drop by 0.4 percent while increase by 1.1 percent in 2014 and by 1.7 percent in 2015 . 1. Brussels’ political activities have little economic support, and no country will ever enjoy Poland-style terms of integration . Beginning in 1995, the conditions have been toughened for every applicant, with Eurointegration mechanism gradually acquiring the WTO’s pattern where every new participant must comply with the wish list of all club members. Brussels’ political activities have little economic support, and no country will ever enjoy Poland-style terms of integration. 2. The EU draft accords on associated membership for Ukraine contain trade limitations harsher than those for Turkey under the 1963 Ankara Agreement. In fact, the draft envisages free trade for EU countries on Ukrainian (Moldovan) territory but not vice versa. Kiev will not gain major preferences until it receives full membership, which is impossible in the short run. At the same time, the period from 2012 till 2013 have featured a relatively new phenomenon: the recognition of the post-Soviet integration both as a fact and as an overly efficient model. Such an assessment is not found in the documents of EU economic and political governing bodies, as this would mean uncertainty about the exclusiveness of the European integration model. As I see the situation, the reinvigoration of the Eastern Partnership in 2012-2013 is a response to the emergence and growth of the Customs Union. In this context, the economic integration of Ukraine is all of a sudden emerging from Kiev’s own choice as a key issue in Russia-EU relations. Effectiveness notwithstanding, the Russia-Belarus union has been too local and has not become a true alternative to European integration. After the USSR collapsed, the newly independent states hurried to establish their own national strategies for socio-economic development. The rupture of former Soviet links has affected economies of all ex-USSR republics. Because of this, Ukraine has suffered the longest transformation-related recession and apparently the worst GDP drop in the post-Soviet space. By the late 1990s, international cooperation took a turn toward pragmatism and objective economic factors. Countries began restoring wrecked ties on a new basis, although on a smaller territorial scale, trying hard to find new forms and models for post-Soviet integration. These developments have brought about the Customs Union and the process of multi-level and multi-speed integration. Hence, the Eurasian and European integration drives appear to have the same methodological basis. According to Lithuanian political scientists, the current logic of multi-speed integration means that core countries deepen mutual integration, strengthen their negotiation positions vis-à-vis nonaligned states, thus pushing others to joining the company , which happened both in the European and Eurasian cases . However, this point remains in practice rather than in theory. Established by Russia, Belarus and Kazakhstan on January 1, 2010, the Customs Union is a qualitatively different and deeper stage of integration. The Eurasian Economic Union to be launched in 2015 should ultimately demonopolize the integration vector of Brussels. Although with some reservations, one may agree with the conclusions by Lithuanian experts  "on competition rather than their harmonization of the two alternative integration spaces seen as integration hubs." Notably, competition between the EU and the Customs Union initially was not an imperative. Russia's neighbors have been offered the Eastern Partnership as a proposal "one cannot refuse," suggesting an inevitable rejection of the eastward integration vector. The results are deplorable, as Minsk and Yerevan have actually dropped the idea. Ukraine is growing into an economic and political conundrum for Brussels, since it cannot acknowledge its political and economic inability to integrate Kiev as such. At the same time, Brussels is still attractive to Kiev as a symbol of European unity, although even proponents of Eurointegration appear cautious about the prospects of interaction. In addition, the bulk of the Ukrainian elite is aware that westward integration means political suicide. The key problems lie in the economic field. Both the Russia-Belarus Union State and Russia-Kazakhstan relations demonstrate that Moscow is ready to share markets, sectors and quotas. This process has been slow and frequently controversial, but either way involves a dialogue where positions of Minsk and Astana are at least proportional to their economic potential. But Brussels wants to have everything – something for liquidation and something for restructuring. Out of Ukrainian produce, Europe needs only rapeseed. Ukrainian industrial products are even a greater nuisance. Kiev has been offered alterations to the railway track standard from Russian to European, which is also beyond debate. Optimists believe that this disaster can be only postponed, while historians have reminded policymakers that some of Ukrainian tracks were adapted to the European standards in 1941-1942. 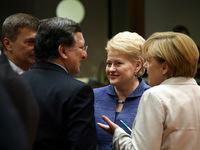 In any case, the Vilnius Summit would mean a diplomatic victory for Lithuania. Brussels needs a positive result, i.e. the signing of the Association Agreements, and Vilnius has already made it available. For a brief time, the capital of Lithuania will serve as Europe's main diplomatic platform, which could be definitely exploited in diverse ways. The Eastern Partnership format does not rule out proposals for a constructive dialogue between Brussels and Moscow. The context appears suitable for launching new ideas on integration from Lisbon to Vladivostok, as well as initiatives for improving relations between Russia and Baltic states. Instead, Lithuania positions itself as a center for retraining post-Soviet countries and unbridles a massive anti-Russian propaganda campaign, although the move appears absolutely groundless. At first glance, the economic trends of Lithuania and all Baltic countries are now positive. In 2012, Estonian GDP growth was 3.4 percent, Lithuanian – 2.6 percent, and Latvian – 5.3 percent . But several details are needed about the causes of this success. This is what Martin Wolf, chief economics commentator at the Financial Times, writes about the advantages of the Baltic states: “First, according to Eurostat, Latvian labor costs per hour, in 2012, were a quarter of those of the Eurozone as whole. Second, these are very small and open economies. The more open the economy the larger is the portion of output not dependent on recession-hit domestic spending. Third, foreign-owned banks play a central role in these economies” . Russia's neighbors have been offered the Eastern Partnership as a proposal "one cannot refuse," suggesting an inevitable rejection of the eastward integration vector. There are also demographic and migration problems. Professor Charles Woolfson, a Swedish sociologist, points out that during the years of independence, Lithuania has lost 18 percent of employable population, with this process of evacuation becoming a national catastrophe . During the post-war years of the Soviet occupation, the Lithuanian population increased by one million, i.e. from 2.7 to 3.7 million, mostly through natural growth. At the same time, during the period of independence, the country has lost 616,000 persons, an unprecedented phenomenon both for the peacetime and wartime history of the country. According to polls, 12.4 percent of Lithuanians would emigrate, and over one-third would like to stay abroad for some time . In conclusion, in contrast to Estonia and Latvia, Lithuania may boast its “zero-option citizenship”, but neither a Pole from Vilnius or Šalčininkų District nor a Russian from Klaipėda or Visaginas would dare to qualify the interethnic relations in the country as sound. In this context, Lithuania's presidency in the EU may become significant for Vilnius due to the linkage to the Ukrainian issue and the coming summit. In any case, the publicity effect will be made available because the expected participants will anyway come up. However, irrespective of the outcomes of the Vilnius outcomes, many will remain unhappy within the split Ukrainian society, more clout will go to the Eurosceptics who regard the EU’s future expansion as a threat to its integrity, and more difficult problems will emerge in the EU-Russia relationship. In the long run, these factors should affect the economic development of the European Union, Russia and Ukraine, with gains acquired only by Lithuania (actually its ruling elite). No matter what results the summit brings, Lithuania is already known for its unbending anti-Russian stance and enjoys this reputation in the European political establishment. With no economic achievements to boast, Vilnius has found an outlet in political operations in the post-Soviet space. 1. Jiři z Poděbrad (4/23/1420 – 3/22/1471, Prague), King of Bohemia in 1458-71, who initiated a project for uniting major European monarchs and strengthening peace in Europe through deeper political cooperation. 4. Preparing for entry into the EU, Polish negotiators squeezed out immensely preferential terms for agriculture, a key Polish sector. 7. Under the theory of international integration, the wording is related to the so-called intergovernmental approach that accentuates the role of states within the integration process. Meanwhile, the ideology of the Report also reflects the influence of neofunctionalists who believe that the spillover effect prevails. 8. Eurasian Union: a Challenge for the European Union and Eastern Partnership Countries. 12/19/2012, Vilnius.